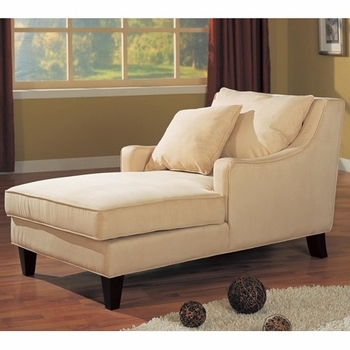 Relax in style with the plush comfort and contemporary styling of this chaise lounge. Track arms, substantial tapered block legs and a plush pillow back contribute to the modern look and feel of this accent chaise. A neutral microfiber fabric wraps the entire piece for a chic, sophisticated finish that offers supreme comfort in addition to contemporary style. Welt cord trim on the arms, base and seat gives the chaise a tailored look, and a rich cappuccino finish on the exposed block legs completes its modern inspired design. Place in a corner of your living room for stylish accent seating, or let it occupy front and center in compact spaces like a sunroom or den.